The SNES port of the original Final Fight may have successfully translated the gameplay from arcade to home console, but it was missing some key elements: the third character Guy, an entire level and — most important of all — the vital two-player co-op mode. Capcom sought to rectify these shortcomings in the SNES-exclusive sequel, but sadly the end result is rather less appealing than its forerunner. As before, the enemy you're facing is the sinister Mad Gear gang, which has somehow survived the death of its leader in the original game and has expanded its network beyond Metro City. Final Fight 2 takes place all over the globe, in locations such as Hong Kong and Holland — which, according to Capcom, has plenty of hills and is so battle-worn it resembles the Somme, 1916. Impressively moustached wrestler-turned-mayor Mike Haggar makes a return, but Cody and Guy clearly have more pressing engagements, as their places are taken by South American swordsman Carlos and female ninja Maki, respectively. Despite the new cast members, the gameplay is almost identical. You have one button for punch and one for jump, and pressing both simultaneously triggers a 360-degree special attack that drains a little of your vitality bar. You can grab enemies and throw them into other characters, and it's also possible to grapple and administer damage. Finally, Mike can grab enemies, leap into the air and pile-drive them into the ground, while Maki has inherited Guy's wall-jump move. There's not a massive amount of variety in your attacks, and if you got bored of the limitations of the original game then there's little here to revive your interest. The most significant addition to the sequel is the reinstatement of the two-player mode. Playing with a friend enriches the overall experience, but the repetitive nature of the game — combined with its disappointingly low difficultly level — means that when two players are involved, it actually becomes less challenging. This isn't helped by the lacklustre enemy designs and uninspiring levels. We don't know quite how they did it, but Capcom's designers have managed to make all of the different international locations look more boring than the single city which Final Fight inhabited. So keen was Capcom to make up for the shortcomings of the SNES original that it even went as far as to include Rolento, the boss missing from the first title due to the fact that his level — the industrial zone — was cut due to memory constraints. Rolento — or "Rolent" as he is called in this particular game — looks a little goofy when compared to his original design, and his appearance is something of a let down. The fact that he looks cooler than the other bosses in Final Fight 2 should tell you everything you need to know about the overall character design in this title. Final Fight 2 makes perfect sense on paper — take the original game, put in what was missing and roll it out for massive critical acclaim and bumper sales. Sadly, while this sequel does indeed add another character and boast a two-player mode, it's a pale imitation of its predecessor. It lacks the endearing visuals, the catchy music and the memorable bosses of Final Fight, and to add insult to injury is insultingly easy to complete on the default difficulty level. 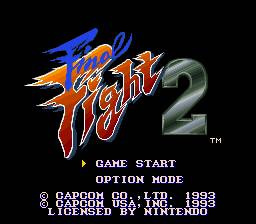 Devoid of the spirit which made the first title so engaging — and lacking any fresh ideas of its own — Final Fight 2 is a wasted opportunity. The vapid gameplay renders the two-player mode almost irrelevant, which in turn means you're better off downloading the original, even if it is missing some vital ingredients. I'm not quite sure why anybody would recommend the SNES port of the original Final Fight over it's sequel...it's not just that there were features removed from the arcade version, but the gameplay in the first SNES Final Fight felt a little off as well...the hit detection has never felt quite right to me and the characters don't move as fluidly as they should thanks to some missing frames of animation. Final Fight 2 is at least it's extremely playable...the controls feel that bit better and the hits feel like they're connecting more...the graphics are an obvious improvement and it has a good 2 player mode. The only thing I thought was a real let down in Final Fight 2 was the bosses....very easy to defeat with extremely predictable attack patterns, but the fights were made boring by their ridiculously long energy bars. In ever other aspect it was an improvement. Though it may not be as memorable as the original, I still think it's worth owning. -Three characters, one of which is Maki. Nuff said. -Two players. Again, the first SNES game only had one player mode. -Globe trotting! The first game was just confined to Metro City. And I disagree that the environments aren't memorable- what about fighting on top of a train, or an airport runway? -Moving up and down on the map. Yeah it's not a big deal today but it's still something the first game didn't have. As for the difficulty... let's face it, the only reason the first SNES game was so difficult was because of two factors: The enemies were able to kill you in only a few hits (heck, some of the bosses had attacks that took HALF your life bar! ), and you were sent to the beginning of a level every time you got a game over. If you took those two things away, it would be roughly the same difficulty as Final Fight 2. Anyway, if you want it to be more challenging, you can always adjust the difficulty. I'll give you that the enemies and bosses aren't as memorable as the first game's. But I wouldn't rank this a paltry 5/10, not at all. I have not yet played this one but likely will get around to it as I love the genre. I must say my first impression of the game when I looked into it was that the character designs were not as interesting. I think Capcom has been up and down with their character designs over the years. The game's feel really matters a lot in a beat em up and boring character designs and locations can hurt an otherwise good experience. Nice to see that they fixed the technical problems of the original which were unfortunate. I'll have to play this one eventually and see if my overall reaction is the same as the review. I have yet to try any games in the Final Fight series, as I never had a Super Nes and mainly played Streets of Rage 2 on my Genesis. Well this review turned up quicker than I thought it would! I agree, Final Fight 2 is most definitely not as good as the original. The pacing was painfully slow (it takes a full hour to beat; if a beat'em up is going to be this long, it had better have elements that make it flesh out, which was not the case here; blame it also on the fact that later on are enemies that take way too much damage to defeat, not to mention only three enemies can be fought on screen), the music is largely uninspired (save for the ending, which I thought was the only good song in the package), the final boss is a joke, the controls are pretty much the same as the original, there isn't as much fun to be had here, and it's basically Final Fight 11/2! I will give it this though: the visuals are still fantastic, the cameos by Chun-Li and Guile (and Zangief to a lesser extent) are clever, and the fact that the full ending can be viewed after having beaten it on the hardest difficulty setting (which is possible) does give it some replay value. Too bad it had to be for a beat'em up that was, in my opinion, too damn long for its own good! If anyone liked the game, that's great; to each their own, this game just personally did not work for me all that well. If anything, I found the first Streets of Rage (which has not aged well, imo, but I find decent at best) to be more enjoyable and superior to Final Fight 2. I've yet to play Final Fight 3, which I often hear is the best in the series (and I'm truly curious about it), but atm I'm a little weary of Final Fight after having played the second one. I played the Japanese version for the Super Famicom (for purism reasons among other things), which includes the first boss with the meat clever and the female ninja enemies. There's some blood after a character or enemy gets hit with a knife, though I sincerely doubt they kept that for the localized version. Out of all the Super Famicom imports I made in the past year and a half, this one is my least favorite. Another good review, Damo! I think a 5 for this game is fair (a 6 would be too, but 5 works). I look forward to reading your Final Fight 3 review. I'd probably give it a 6 (mostly because I'm a sucker for the genre) but I gotta agree with this review. It's nothing too special. I think that 5 is too low, it's a good beat 'em up. Still gonna buy it. Gotta have the complete series. And for anyone that's curious, yes. Including Streetwise. "Capcom sought to rectify these shortcomings in the SNES-exclusive sequel, but sadly the end result is rather less appealing than its forerunner." Actually, there was a limited-edition (only available for rent at Blockbuster, and not sold in retail?) version of Final Fight, named "Final Fight Guy," which had Guy in Cody's place (you could only select Haggar and Guy). It still didn't have two-player co-op, though. next gen console and she give love game oMG. I got the third one and I would still get this one to play co op, which renders the first one useless for me. What do you mean too easy? If anything it's too difficult, mostly because of very strict hit detection along the isometric planes and a couple of very cheap bosses. I need to play co-op just to be able to beat the game on the lowest difficulty setting. (Of course, it did at least fix the major issues from the SNES port of FF1, which is why I never bothered with the VC version of that game and instead bought a used copy of the GBA port). Thankfully, Final Fight 3 fixed these problems and is easily the best of the trilogy as far as the SNES ports go. The only downside is that Lucia is nowhere near as hot as Maki is. Huh. 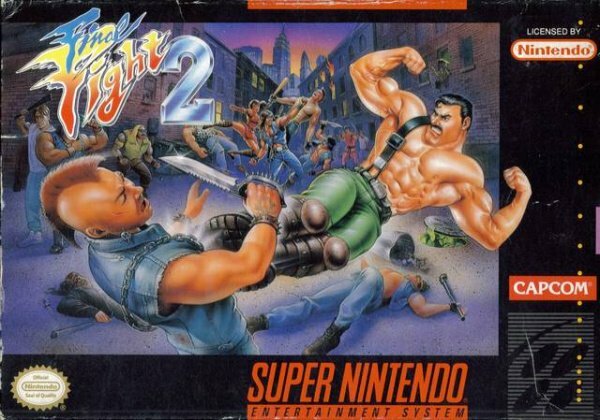 Final Fight 2 was probably the first import Super Famicom game I ever played on my SNES, not too long after the game's release. Now all they need to do is make a new Final Fight game, and bring Maki back with her moves from Capcom vs. SNK 2. I disagree with almost everything with this review, this game to me is an improvement over the original not to mention better than the arcade version of the first game. It's easily an 8/10 rating game to me. @retro_player_22 I doubt you'll find many people who believe this is better than the arcade version of the first game. But each to their own! I found out through this site's tumblr, but happy birthday, Damo! While I have to say I do enjoy this game to me it just doesn't feel like a Final Fight to me if that makes sense. 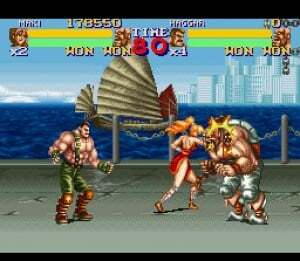 In fact if it wasnt for Haggar's and Andore's sprites this game wouldn't even be a Final Fight game. It is a fun game dont get me wrong but it is the weaker of the 3. @Akira But "Final Fight Guy" didn't actually fix anything. It still left out one of the characters, one of the levels, and the co-op mode while doing nothing to address the technical problems. @WanderFan91 Thanks! Hopefully you'll stay around? @BulbasaurusRex: It fixed the problem of the missing Guy. ^_^ That was probably the complaint I remember hearing the most about the Final Fight port - being unable to play as Guy. Now, I know Final Fight Guy was probably put together really quickly and easily... swap Cody's character files for Guy's (more than likely created for the original version) files, make a few small yet inexplicable modifications (lock the options menu behind a button code), recompile, playtest, release. It still was an attempt to address something people didn't like about the original SNES release, though. I remember I played this before. 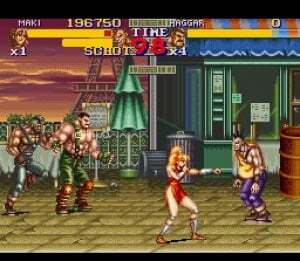 Final Fight 3 was better, but Street of Rage 2 and 3 have much varied gameplay. I remember this game looked amazing back in the day when I was looking at the screen shots in gamepro magazine. Once you actually play it you'll find it does not hold as well as Street of Rage series or the first Final Fight. I don't get that low of a score at all, speedyboris up there a ways really laid out the improvements. While I don't agree with him the audio improved, all his other points are quite valid. Yours about it being quite easy is valid as well, and it's a shame, but you know, there are difficulty options too. I think a 7 would have been more accommodating for the pluses and minuses to this sequel. I'm no FF fanboy, and in all honesty I never even owned the game up until about I think 2 years ago, same with #3 as well. I never had a shot at it when it was fresh, but I did get one in the modern era where much other games could have degraded its quality horribly for me. Truly though as much as I beat the original to death back in the 90s, THAT one is the lowest grade failure to me with all the problems it had, the whole stage, boss and Guy being ripped out, neutering the women for some stick boy trannies and the minor blood spatter from pipe and blade hits as I was playing the arcade unit at the same time. IT caused me never to buy Final Fight 2 or 3, and I regret that as they're both great brawlers that poop all over the gutted snes original. The fact Capcom declined to use the other two characters in the third game and they declined to use Guy/Cody in this second game tells you all you need to know about Capcom's thoughts on this installment.